Senators Investigate Reports Wells Fargo Punished Workers Elizabeth Warren and two other senators are asking the bank about reports of retribution against would-be whistleblowers. The senators cite NPR reports about workers who were fired or pushed to quit. Sen. Elizabeth Warren questions John Stumpf, then CEO of Wells Fargo, during a Senate Banking Committee hearing on Sept. 20. 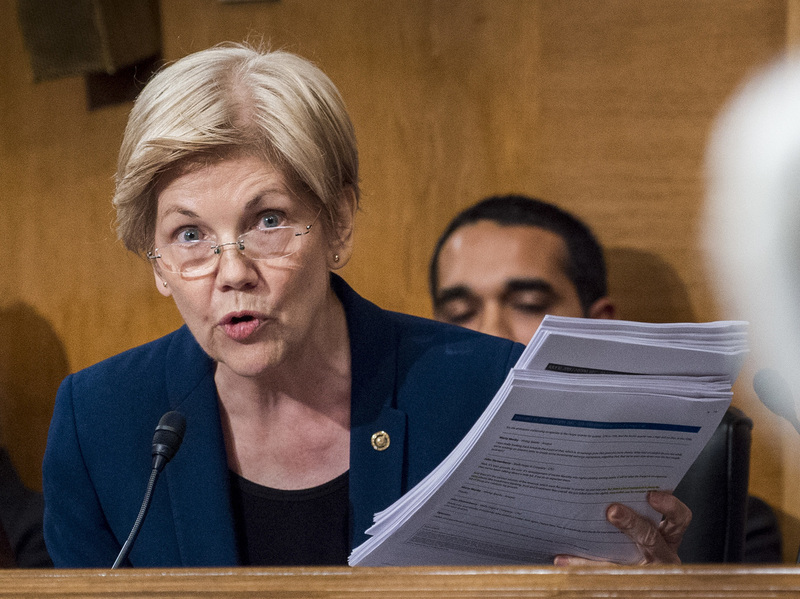 Elizabeth Warren and two other U.S. senators are demanding answers from Wells Fargo about reports of retribution by bank managers against would-be whistleblowers. This marks the latest development in the ongoing consumer banking scandal engulfing the banking giant. In a letter to Wells Fargo's new CEO, Timothy Sloan, Warren, D-Mass., and Sens. Robert Menendez, D-N.J., and Ron Wyden, D-Ore., say the bank may have "misled regulators about the scope of the fraud." The senators extensively cite reporting by NPR about former Wells Fargo workers who were fired or pushed to resign after they called the bank's ethics line. The workers say they were resisting the widespread unethical sales practices that are at the center of the current banking scandal. Wells Fargo opened as many as 2 million accounts without customers' consent. In an interview with NPR Friday, Warren said regulators and the general public want to "protect whistleblowers. When somebody says there's a problem here, their employer doesn't get to attack them." But former workers from four states tell NPR that's basically what the bank did to them. Wells Fargo wrote negative comments about the workers on their U5 documents — a U5 is basically a report card used by the industry. They say this amounted to a scarlet letter that has badly damaged their careers. "Wells seems to have taken the attitude that if there's something wrong here it's the whistleblower's problem and that the whistleblower is a troublemaker," Warren says. NPR spoke to former Wells Fargo workers in Los Angeles, San Francisco, Florida, New Jersey and Pennsylvania. They all have negative U5 comments written by the bank after they were fired or resigned. They say the comments are inaccurate and hindered their job prospects and caused them financial hardship. They all said they were fired or pushed to resign after resisting the pressure to push products on customers that they didn't want and for reporting unethical practices in their branches to managers or the company's ethics line. And they see these damaging comments on their U5 as retribution by the bank for their refusal to go along with the unethical sales culture. The senators say that these reports as well as information from the Financial Industry Regulatory Authority "paint a disturbing picture" about Wells Fargo's treatment of potential whistleblowers. Fear of retaliatory action from the bank could have prevented potential whistleblowers from coming forward and exposing the fraud. To address this concern, the senators are asking Wells Fargo for extensive information about workers it labeled this way going back more than a decade. Wells Fargo has said it is disturbing to hear claims of retaliation against workers. And the bank says it is investigating these claims. The U5 system was set up decades ago and is operated by FINRA, an industry self-regulatory group. Lawyers and regulators who spoke to NPR said the system has served a good purpose by labeling bad actors in the financial industry. Getting a bad mark on their U5 blocks truly unethical brokers and bankers from hopping from one financial firm to the next and continuing, for example, to defraud customers. Banks and financial firms are required to list a reason on a U5 form after they fire an employee if the employee is authorized to sell investment products to customers. "The Wells Fargo scandal exposes how vulnerable bank employees are under the current system," Warren told NPR. "The idea of bankwide fraud is something that the FINRA system wasn't designed to catch and in fact may help the banks squelch their whistleblowers and others who would try to correct the problem. I hope that we're going to see some changes come out of this." The senators also say their review of the U5 data goes beyond the whistleblower issue alone. They say that failing to properly disclose and examine U5 forms may have misled the Consumer Financial Protection Bureau and other regulators by concealing key information on the forms. In their letter, the senators say that "the bank may have deprived FINRA and other regulators of information that could have allowed them to uncover and stop the illegal activity at Wells Fargo well before the September 2016 CFPB settlement." The senators also noted that "Wells Fargo has a history of compliance problems related to U5 reporting" and requested information on the bank's U5 filing, review and amendment process. FINRA has launched its own internal U5 review of Wells Fargo but has not disclosed details yet. Meanwhile, investigations into Wells Fargo continue. As Warren said, "this isn't over yet." For its part, Wells Fargo says it has put a team in place to help former workers who qualify to be rehired for open positions at the bank.